Hello everyone! I'm back from Jamaica! We had a wonderful time and I already miss the beach. The weather was great and the resort was really nice and definitely had the Jamaican atmosphere. One of the main reasons we picked this resort was for the snorkeling. 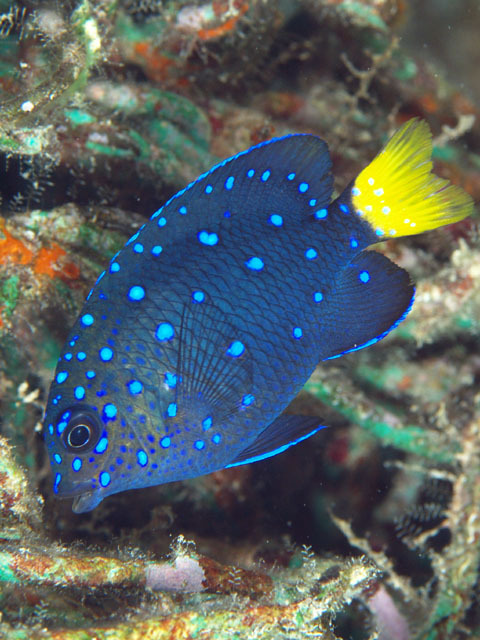 There are reefs off shore that you can snorkel out to and see so many creatures and beautiful fish! We only left the resort a few times to shop and eat at Margaritaville. It was a little scary off the resort, but it was good to experience some of the Jamaican culture. My mom and dad enjoyed the trip too. We all love the beach! In the shallow parts around the rocks you could see fish swimming around. See the small barracuda? Believe me...I saw some bigger ones with teeth! They usually don't try to bite unless they see something shiney. Some of the staff said there is an 8 foot barracuda that they named Johnny that hangs around sometimes. Glad I didn't see him! The views were so beautiful! This was taken from our balcony. You can see the reefs off shore. There was some sea grass in some spots right off the beach. It didn't bother me though, I always had my fins on and just snorkeled right over it. Lots of creatures live in there. That is our resort in the background. 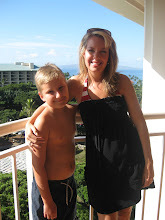 Here I am before going snorkeling. You can see Chase in the background. Chase loved hunting for creatures! He found several star fish, crabs and some really strange things too. There were also sea urchins and giant jelly fish we had to stay clear of. Our resort was really nice and had several pools and even a lazy river. The lobby was all open and there was always a nice breeze. We loved to sit and enjoy an alcohol free pina colada or strawberry daiquiri. One day we took a shopping trip. It was interesting to say the least! Our last stop was at the craft market and we all felt like bait in a shark tank! lol...As we got out of the van all of the vendors were competing for us to come look at their booth. We only had 30 minutes and could only pick so many. They are very persistent and really want to make a sale! Here is this lady's store. She was a very nice lady and was very persistent. I did end up buying a bracelet from her for $20...I probably could have bought it for $10! I just don't know how to wheel and deal! She said I started her day off great so that made me feel good. Margaritaville also had slides and trampolines you could jump on. There are so many beautiful flowers and plants everywhere you look. These tropical plants were all over our resort. The orange flowered trees are called poinciana trees and were everywhere! Aren't they beautiful? Our driver said the berries are used to make jewelry. Well, I already miss this! Hopefully we will get to visit another beach next year. It was a great vacation! Welcome to Share Your Creations Party #42! I hope you will link up and join in the fun! Since today is the first day of summer I thought I would feature some summer inspiration from a few weeks ago. 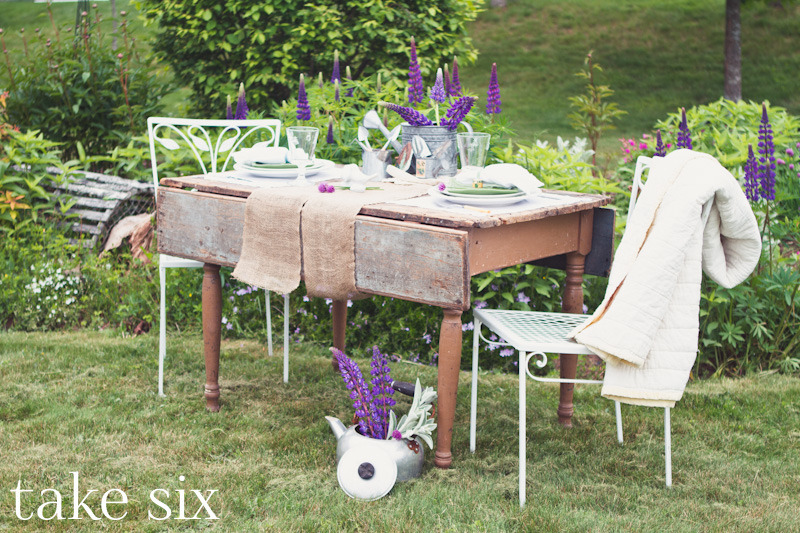 This garden tablescape by Take Six is just beautiful! Perfect for a summer day...Those purple lupins are gorgeous! I would love to grow them someday. 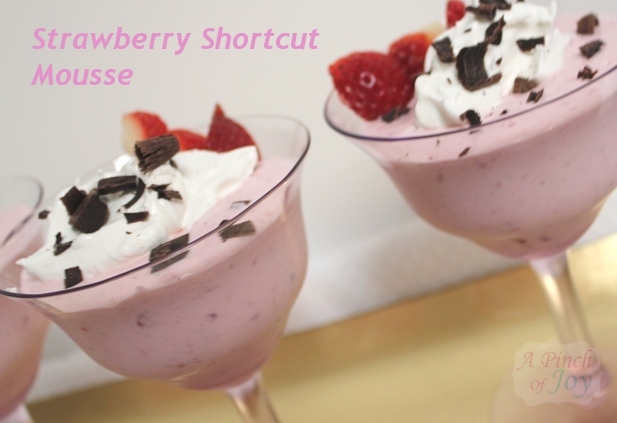 Doesn't this look yummy for a hot summer day? Visit A Pinch of Joy for the recipe. 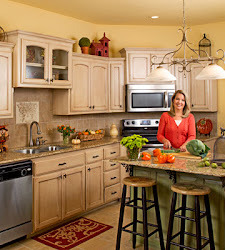 Be prepared to find lots of wonderful recipes on her blog! 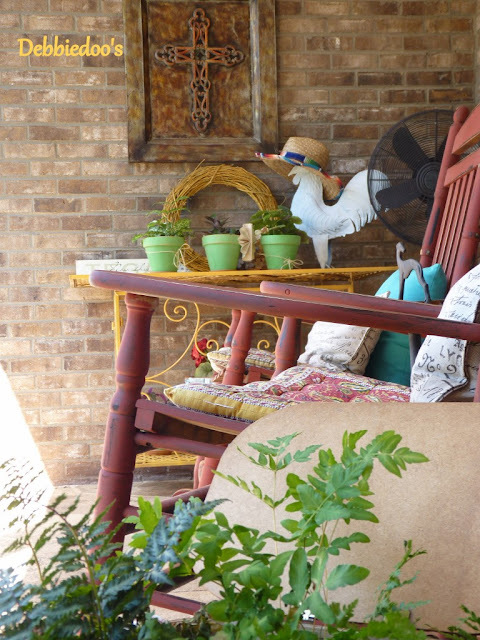 Debbie at Debbiedoo's shared her colorful summer porch. 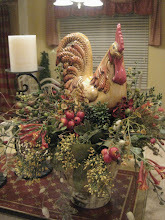 I just love the hat on that rooster...too cute! Visit her for some fun summer inspiration! 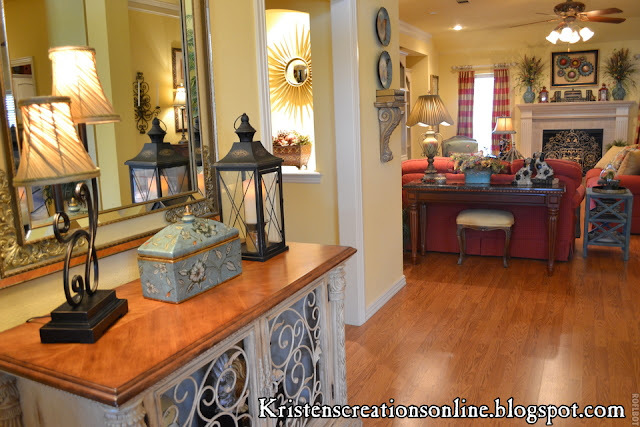 For my creations I thought I would show you a few things I have done in my kitchen. I found the lemon pitcher at T.J. Maxx a few months ago and decided to add some silk flowers and berries to it for a wildflower look. I am also looking for more lemon accents such as napkins and napkin rings. Has anyone seen any cute lemon accents lately? Now this is really simple! I set this birdhouse on an iron candle holder and wrapped some vines around it. 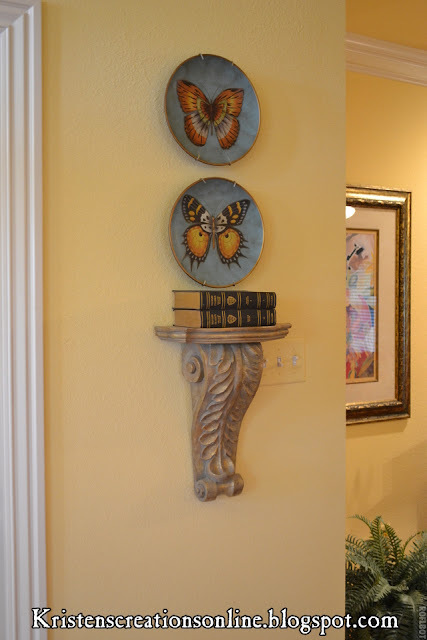 I found this butterfly basket in Dallas a few months ago and filled it with yellow silk flowers and greenery and set it on top of my cabinets. As you probably know by the new plates I showed you the other day, I am really into butterflies! The french bee burlap containers came from T.J. Maxx too. I just added the silk greenery to them yesterday. I usually like filling them with fresh flowers. I'll be working on the kitchen more when I get back from Jamaica. As you can see I am ready! LOL! This is probably how I will look the whole time I am there. We are all looking forward to snorkeling! I hope to post lots of pics of our trip on my Facebook page as long as I have Wi Fi...so come along with me! We are flying out of Tulsa early Friday morning and are staying in Tulsa tomorrow night. We will be back late next Thursday so no Share Your Creations party next week either. I'm so sorry! When I get back I will definitely get back in blogging mode and will also be making new items for my Etsy Store. I've been a little out of the loop lately! Please add a link back to my blog so others can find the party. 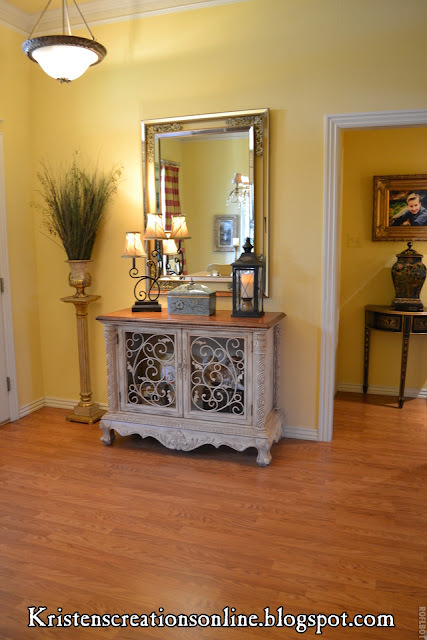 You might remember several months ago I moved this chest into the entryway. It used to be in the living room but needed to be moved in order to fit the piano. I like it better than the bench that used to be here. 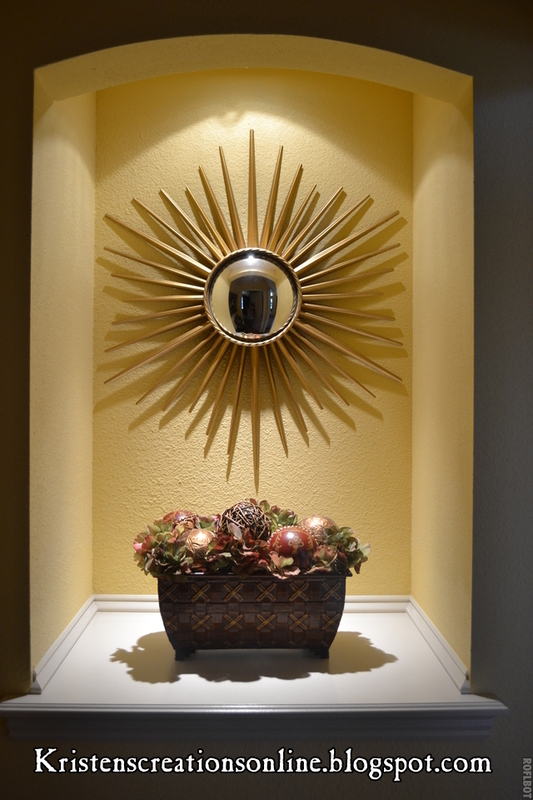 I always wanted a lamp in the entryway and found the two shaded one at Hobby Lobby and really liked the shape of it. As you can see the rug I ordered a while back did not work! I am constantly looking for one with just the right colors. 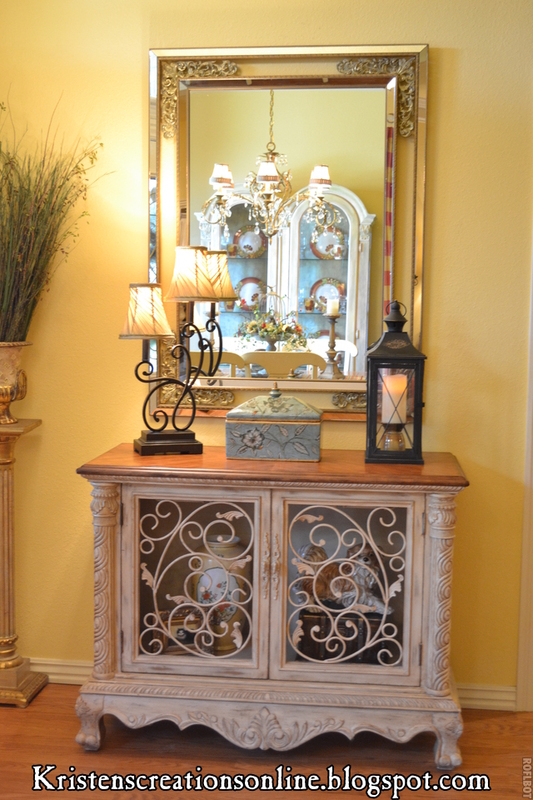 Here is a closeup of the chest and what you see when you walk in the front door. The dining room is to the right. I also showed you this mirror I purchased a while back. I put it in the niche because I love the way the light reflects off of it. I put the container with orbs together this morning. I like it ok, but am still keeping my eyes open for just the right thing. I recently found the butterfly plates and love them! They fit perfectly on this small wall next to the niche. I haven't been doing alot of decorating lately, but will show you a few things I've done in the kitchen at my Share Your Creations party. I am changing it to Wednesday this week due to our vacation. I hope you will join in the fun! Have a great Tuesday! Our Trip To Washington D.C.
Hello everyone! I'm back from my trip to Washington D.C.! It was fun and exhausting at the same time. We were definitely on the go from morning until night, but you have to be in order to see everything. Although, there is no way you can see it all in the three and a half days we were there. I think we all enjoyed the Smithsonian Natural History Museum the best. There was so much to see there! It was incredible...I have posted a few pics below. One thing we moms and grandmas did not get to do was take a tour of the White House. They would only allow six inside and the boys went with their teacher and her family. They enjoyed the tour but I think Chase was expecting to see the President in the Oval office! Ha! They said they enjoyed the Capitol tour better. We all got to see it and it was amazing! Here are the boys in front of the White House. Here they are with Arkansas Senator John Boozeman's wife before going into the White House. One thing the boys could not wait to do was visit the Air and Space Museum. They really enjoyed it and liked the flight simulator. I enjoyed seeing the Write Brother's display and learned so much about them. They really paved the way for the global aviation industry we know today. This is the original 1903 Wright Flyer. I also enjoyed seeing the space part of the museum. This space suit was worn by one of the Apollo 11 crew members. Here is some original food from the first Shuttle mission in 1981. There was so much to see, I just snapped a few pics of things I thought were interesting. We spent almost a full day at the Natural History Museum. It just went on and on! Here we are in the butterfly exhibit. The boys really didn't stay to long in here, they wanted to go see the cool stuff! I could have stayed for hours! There were beautiful butterflies all around us! My mom enjoyed it too. Another thing we saw was the Hope Diamond. This picture is horrible...there were people all around it and I could barely get a picture. Although this diamond is not the biggest in the world it is still huge and extremely rare due to the beautiful blue color. The Smithsonian houses the most beautiful jewelry and alot of it was worn by Kings and Queens. I couldn't imagine wearing this necklace...Wow! One thing I found very interesting was the collection of mineral rocks. It's so interesting to see all of the beautiful shapes and colors that come out of the earth. On to something ugly...have you ever heard of an Angler fish? This fish lives deep down in the ocean and looks like something out of a Sci Fi movie! Look at those teeth! There are also alot of ancient skeletons from animals to humans at the Smithsonian. Like I said...this was definitely our favorite museum! It is a must see if you ever visit Washington D.C. Here is Chase in front of the Capitol. I was so excited to get to tour the Capitol. This is the top of the dome and it was stunning! The beautiful painting in the middle of the dome is called The Apotheosis of Washington and was painted by Constantino Brumidi in 1865. The frieze is located around the inside of the base of the dome and is a chronological, pictorial history of the United States from the landing of Christopher Columbus to the Wright Brother's flight in Kitty Hawk, North Carolina. The frieze was started in 1878 and was not completed until 1953. All around the dome there are eight large paintings about the development of the United States as a nation. They were beautiful! This was a room inside the Capitol, but I can't remember what it was called. I do know it is a room where important meetings were held. One of my favorite parts of the trip was eating out! There were so many great restaurants. On the last night after we ate we ran across this cupcake shop called The Sweet Lobby. On the window it said "Winner of Food Networks Cupcake Wars" so we knew their cupcakes would be good and we were not disappointed! They also had French Macarons which were delish! I think this was my favorite part of the trip...lol! We had a great time, but I am glad to be back. I don't think I could have walked another day! I did a whole lot of nothing yesterday...just rested. Now I have to get ready for Jamaica! We leave next Friday and I can't wait to relax on the beach. I am so thankful to be able to go on two trips this year. That will probably never happen again...lol. By the way, the boys did not win in their category at Nationals. That's ok though, they were up against 99 other groups. We are still very proud of them for getting as far as they did!